DUBAI, U.A.E., 15th January 2015: Emirates, a global connector of people and places, will be able to connect even more people with Chicago on 1st May when it switches from its Boeing 777-200LR currently operating the route to a larger Boeing 777-300ER aircraft, adding passenger capacity. 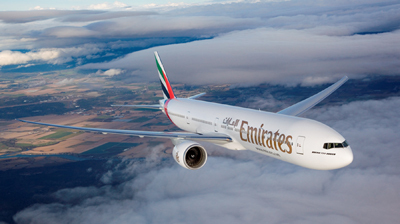 Emirates launched its Chicago service—its ninth U.S. gateway—on 5th August 2014. Less than a year later, the route has carried 66,000 passengers and 3,410 tonnes of cargo to-date. The increase in capacity will offer 88 additional Economy Class seats, representing a 33 percent increase in seating capacity. The choice of premium cabin seats remains unchanged, offering customers a choice of eight First Class Suites and 42 Business Class seats. Chicago is home to many of the US’s largest companies, including Boeing, which is a very important partner of Emirates. Emirates is the largest operator of US built Boeing 777 aircraft in the world, with a 777 fleet of 131 passenger and 12 freighter aircraft which contribute towards the airline’s overall fleet of 232 wide-bodied aircraft. Rich in its cultural heritage, world-class arts establishments, accomplished sports teams and iconic tourist attractions, which attract about 46 million people each year, Chicago surpassed Atlanta’s Hartsfield–Jackson Atlanta International Airport as the busiest domestic airport in 2014. Similarly, last month Dubai International Airport surpassed London Heathrow as the busiest international airport in the world. Emirates’ daily flight EK235 departs from Dubai International Airport at 09:40 and arrives at Chicago O’Hare International Airport at 15:30. The return flight, EK236, departs from O’Hare at 20:30 and lands in Dubai at 19:10 the next day. Both flights offer convenient connections to and from many of Emirates’ global network of over 147 destinations across six continents. The passenger service is complemented by Emirates’ dedicated freighter service which operates two times a week from O’Hare. On-board, passengers can discover ice, Emirates’ award winning entertainment system offering more than 2,000 channels of on-demand entertainment at every seat, dedicated children’s menus and activities, and gourmet regionally inspired dishes with complimentary beverages, while being served by Emirates’ multi-lingual Cabin Crew.